Pima Prevention Partnership and Juvenile Services Coordinating Council implemented AZ STARS in 2003, funded by grants from the Department of Health and Human Services, Administration on Children, Youth, and Families. The Governor’s Office for Children Youth and Families has provided technical support and hosted annual statewide conferences to address issues of children of prisoners. The AZ STARS Statewide Mentoring Project is now improving lives of needy children in seven counties of Arizona. Provide best-practice mentoring services to greater numbers of children in Arizona by matching recruited volunteer mentors with close to 1,000 children of incarcerated parents over the three-year project (2006-2011). The Partnership is a nationally recognized non-profit agency based in Tucson, Arizona. Since 1991, its collaboration with various grass-root groups, nonprofit agencies, government agencies and community leaders has improved conditions for youth and families. Across Arizona, the Partnership continues to develop new and exciting solutions to address pressing problems of the day. The Partnership's goal is to foster conditions for positive change by providing a range of "real world" services and programs to individuals, community groups, and agencies. The AZ STARS Mentoring Project is a collaboration of community agencies that work together to match recruited mentors with children of incarcerated parents. Pima Prevention Partnership functions as the coordinating agency, with services including CIP and Foster Care youth related training, research, and grant management. The Juvenile Services Coordinating Council of Tucson assists in oversight of the program. Big Brothers and Big Sisters agencies in Pima, Maricopa, Coconino, Apache, Navajo, and Yavapai Counties recruit, screen, and match volunteer mentors, then provide ongoing case management to matches. Amachi, Prison Fellowship Ministry, and Neighborhood Ministries recruit mentors and mentees from the faith community as well as provide other supports such as Angel Tree gifts at Christmas and camping opportunities in the summer. K.A.R.E. Family Centers offer a variety of support services to the children and their families such as guardianship information, support groups, and referrals. The Governor’s Office for Children Youth and Families broadens the perspective on CIP issues with an annual state-wide conference. The AZ STARS project is funded by grants from the Department of Health and Human Services, Children, Youth, and Families Division; Office of Juvenile Justice and Delinquency Prevention; and the Arizona Governor’s Office, Parents Commission. With 2.3 million Americans in prison, the U.S has the highest incarceration rate in the world. Currently, one in twenty-eight children in the U.S. has a parent in prison, yet there are relatively few agencies or programs to help these children (The PEW Charitable Trusts, 2010). Children of prisoners are among the most at-risk population of children in our country. The best-practices mentoring given by AZ STARS are one way to improve the lives of these children and help them to become more productive adults. In 2000, the Pima County Juvenile Services Coordinating Council (JSCC) began to address the needs of children of prisoners. The JSCC is a broad-based collaborative institutional partnership which includes law enforcement, mental health services, the courts, substance abuse prevention, and child welfare service providers in Pima County. The Children of Prisoners Working Group was convened with representatives from the Arizona Department of Corrections, the Arizona Department of Juvenile Corrections, Pima County Adult Probation, local law enforcement agencies, crisis intervention and mental health services, child welfare agencies, family advocates, faith based organizations, schools, and other concerned citizens. In 2001, Tucson was selected by the National Institute of Corrections as one of four U.S. communities to receive planning grant funds to complete a comprehensive process to 1) conduct a needs assessment; 2) conduct community planning to create an “action agenda” for CIP in Pima County; with 3) ongoing technical assistance from the Federal Resource Center for Children of Prisoners at the Child Welfare League of America. In 2003, the JSCC through Pima Prevention Partnership was awarded a three year grant from the Department of Health and Human Services, Administration on Children, Youth, and Families for mentoring in Pima County. The Pima County project became a model for other mentoring projects across the state. 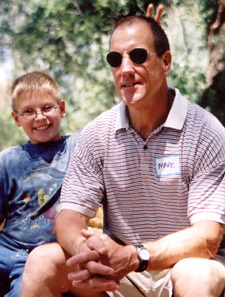 In 2005, Pima Prevention Partnership was granted a contract for mentoring children of prisoners in Maricopa County. In 2006, and 2009, Pima Prevention Partnership applied and was funded for three Mentoring Children of Prisoners grants: STARS Pima, STARS Maricopa, and STARS Northern. The Partnership was also awarded an Amachi VISTA position. The goal that was met provided over 950 children of prisoners in Arizona with best-practice mentoring during the three-year grant. Also in 2006, the State of Arizona’s Bill of Rights Project was chosen as one of 14 partnerships in the U.S. to identify strategies and initiatives to improve conditions for children of prisoners. The Arizona Bill of Rights Project for Incarcerated Children obtained support and technical assistance from Senior Justice Fellow Dee Ann Newell of the Soros Foundation’s Open Society Institute and the Washington, D.C.-based Family Corrections Network. For more information, see Children of Prisoners section of website. In 2009, Pima Prevention Partnership applied and was funded for a statewide Mentoring Children of Prisoners grant. AZ STARS Statewide Mentoring Project is a three-year grant with a goal to provide 475 children of prisoners across Arizona with best-practice mentoring. The Partnership was awarded four Amachi VISTA positions as well. In 2010 Pima Prevention Partnership was awarded a grant from Public/Private Ventures (P/PV) through the Amachi Mentoring Coalition Project. Amachi is faith-based collaborative effort established at P/PV to assist young people through mentoring, and PPP has a goal to provide mentoring to 446 children of prisoners in Arizona during the two-year grant period. For More Information Contact AZ STARS Mentoring at (520) 791-2711 ext 1410 or 1-877-312-1368 , hello@starsmp.org.